There has been one game on my to play list that I have wanted to play for a long time. That game is called Journey. I have heard nothing but amazing things about it. People have called it the game of the year, a must play and an experience that people need to have at least once in their life. A game developed by thatgamecompany and published by Sony for the PS3 on March 13th 2012. Later released for PS4 on July 21st 2015. Finally, I can now say that I have completed it. What did I think? Here are my thoughts on Journey! This will be spoiler-free. You play as a figure dressed in an elaborate red robe. Who he or she is is unknown. The game begins with the figure in a vast desert. The game points you towards a massive mountain far off in the distance. With no other idea what to do, the objective feels obvious. Journey across the land to reach the mountain with an ominous light that glows at the peak. Throughout the journey, the figure comes across various floating pieces of cloth. These cloth pieces are able to be collected. In doing so, the figure discovers that these power up a magical scarf they have on. This scarf gives the figure the ability to jump and fly up high for a limited amount of time. Periodically there are glowing runes which can be collected. These help to extend the length of the scarf, allowing the figure to fly and jump higher. 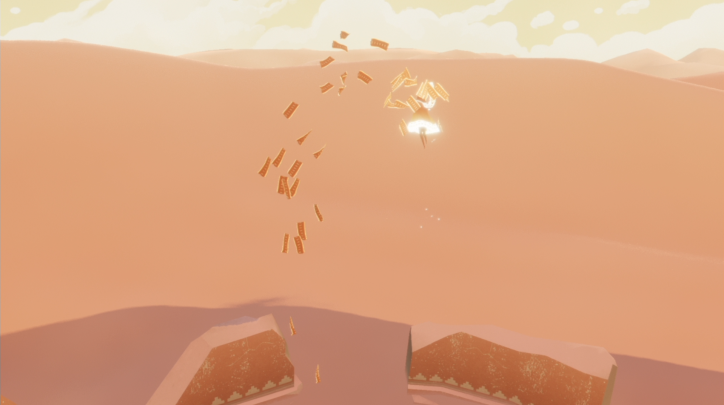 If the character has no scarf power (indicated by the runes on it), they can no longer jump and must find more floating cloth pieces. 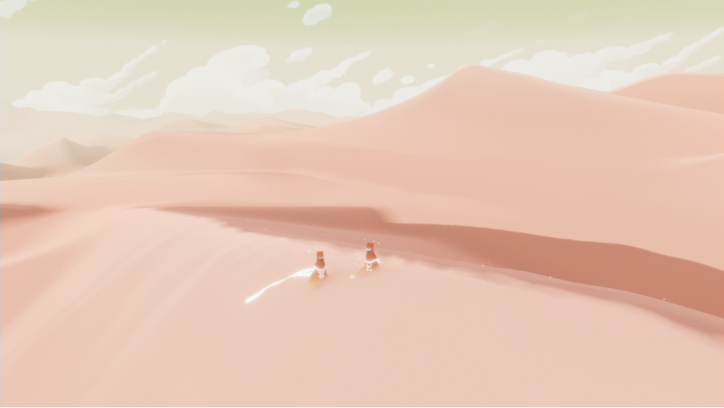 Journey is a game that has no voices. What it does do however makes for an incredible experience. The story is told through the red-robed figures journey, uncovering half buried structures, voiceless visions and runic murals. There are also creatures who look like they are made from the same material as the scarf. Was there once another civilization here? Surely the answers would lay in wait at the mountain. The desert brings with it a sense of loneliness too. Where is everyone else? Queue a strange red-robed figure far off in the distance. A friend! The desert feels isolated, so on discovering someone else brings emotions of happiness and excitement. The figures do not have voices. However, they can sing to one another. Upon discovering this for the first time, it felt pretty amazing. While the two figures are next to each other, their scarfs are kept alive and powered. But what if one figure wants to go and explore a buried building over to the right while the other wants to continue on to the mountain? Only one thing to do, to part ways. This departure brings about emotions of severe loneliness in an endless desert. Back on your own, the figure must continue to explore, expand their scarf and to hopefully reach the mountain. What would be there? This game is absolutely stunning. The art style reminds me a lot of studio ghibli productions. Simplistic but absolutely astounding. 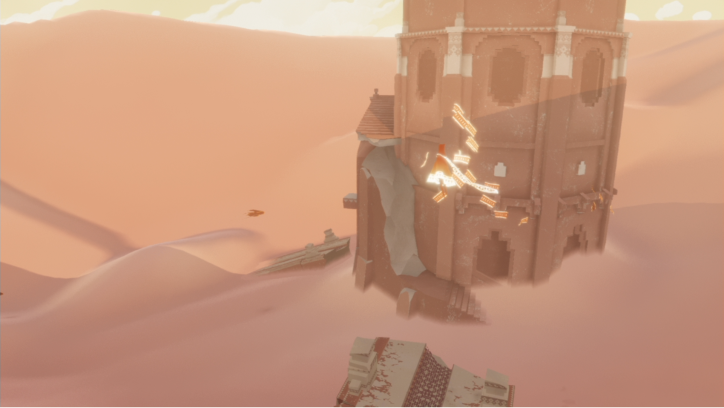 It’s incredible that a game based from a desert can be so stylized. The music as well is beautiful. It adapted itself around places throughout the journey and the actions of the figure. What made the music a feat of joy was the notion of while you progressed through the journey, so to did the music. Overall, I absolutely adored Journey. This has been a game on my list of “must-play games” for a long time. I obtained this game a while ago on the PS3 but never had the time to play it. Since purchasing a PS4, and upon discovering that Journey was available for it, I made sure I bought that too. I think the wait was worth it. This will be a game that I will be able to play time and time again. It does not overstay its welcome, lasting about 2 to 3 hours. 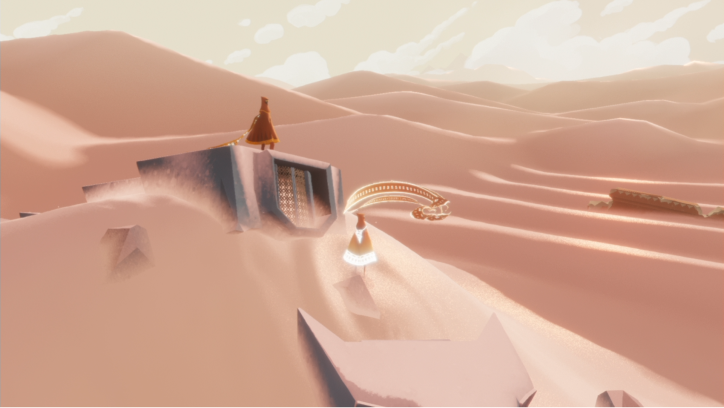 Everything that creates Journey just makes the overall experience so memorable and enjoyable. The music, the artwork and the vastness. Absolutely incredibly made. 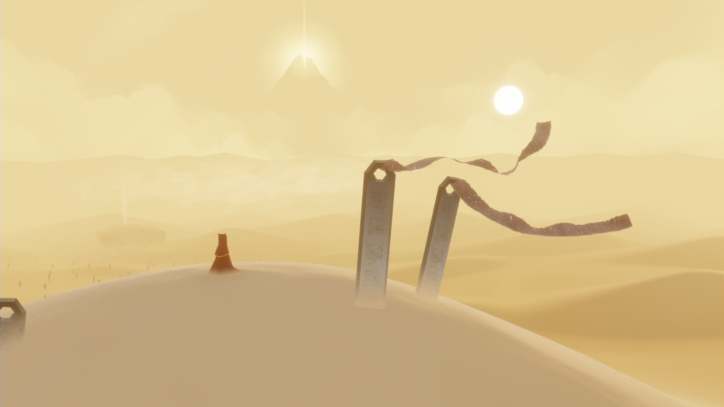 I highly recommend and suggest to anyone who is searching for an incredible experience game, that they play Journey. It is one game that will have me in awe for a long time. 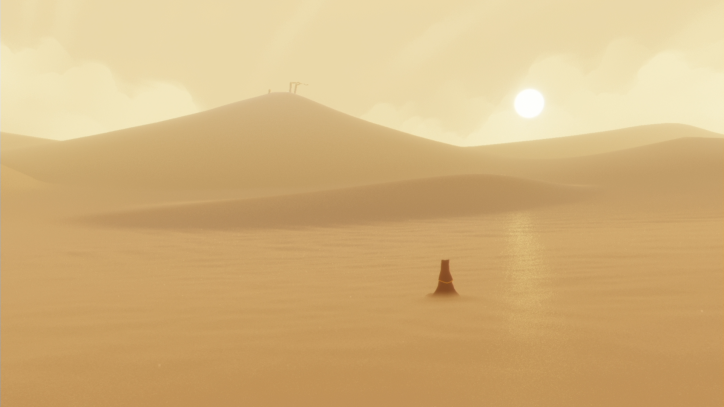 Have you played Journey? If so, what did you think of it? If not, do you think you will in the future? Let me know! Previous Previous post: Avondvierdaagse Day 2! Next Next post: Avondvierdaagse Day 3!